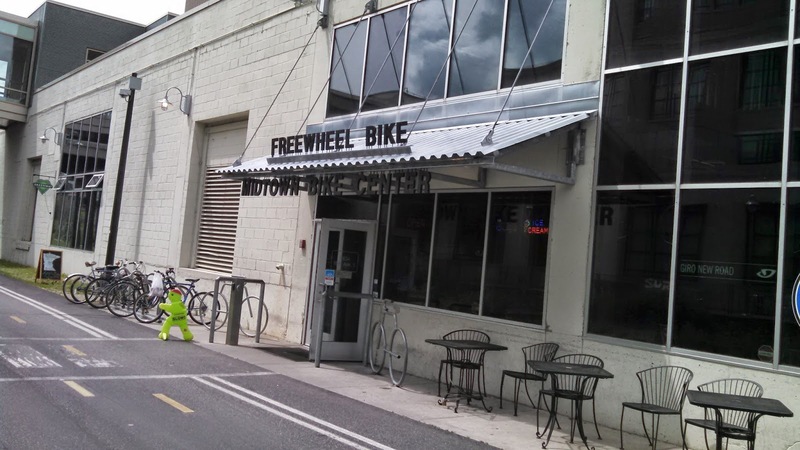 I used a Nice Ride bike share and took a quick tour of the Midtown Greenway. It was a brief visit to a fantastic facility that is a rail to trail conversion. 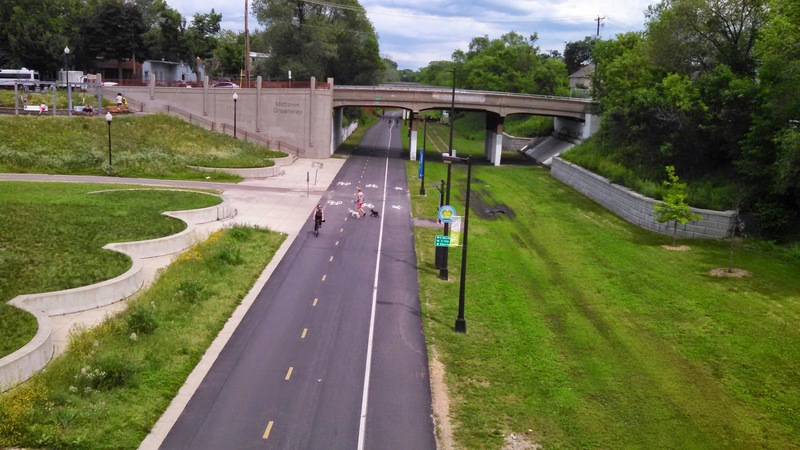 At 5.5 miles long, it is a great connection that serves multiple purposes. I am even more impressed with it than I was when I visited in 2010. I wrote about my experience on the City's streets as well. 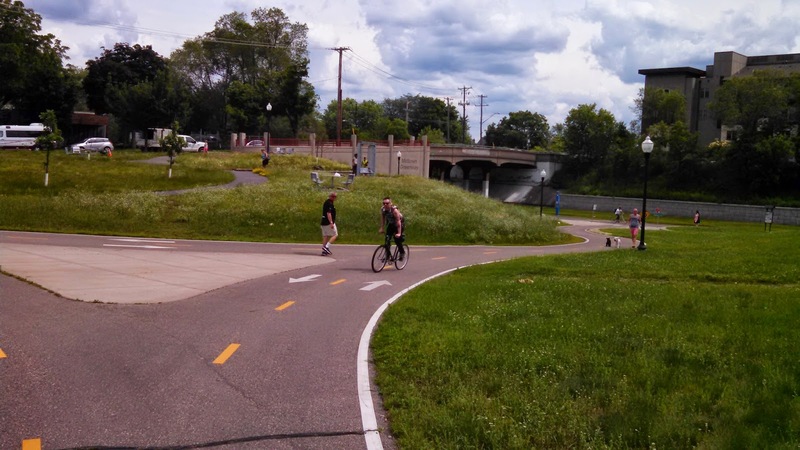 In 2013, the Midtown Greenway was named by USA Today as the Top Urban Bikeway in the US. I think I have seen most of those in the Top 12. The rail corridor dates from the early 1900s. In 1912, the Minneapolis City Council directed the railroad to undertake a grade separation by placing the rail line in a trench between Cedar Ave. and Hennepin Ave. This project took place between 1914 and 1916 and was the largest civil works project in the state after the Stone Arch Bridge crossing the Mississippi. 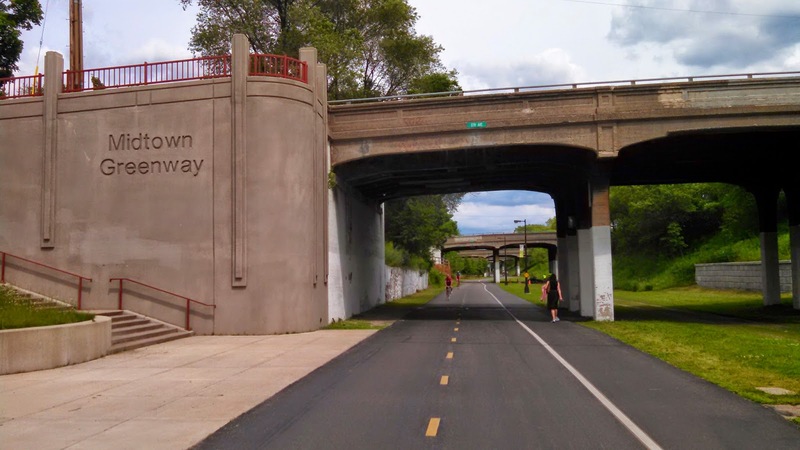 Some 80 years later, rail traffic in the corridor reduced considerably and MnDOT wanted the eastern end severed so Hiawatha Avenue could be rebuilt. 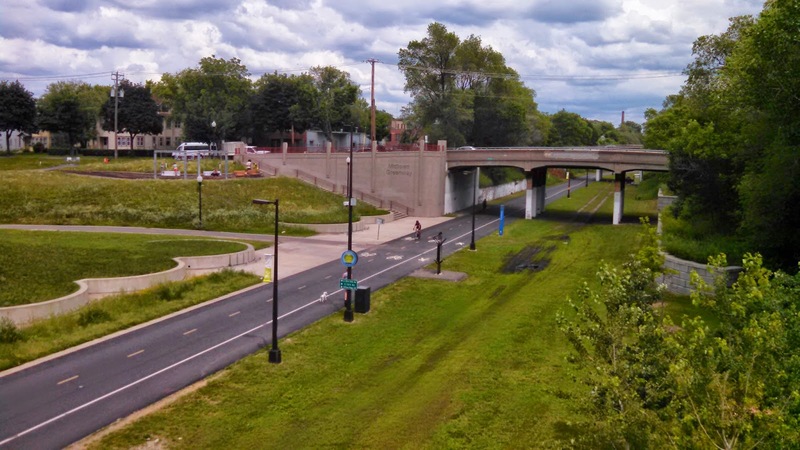 The Hennepin County Regional Railroad Authority (HCRRA) purchased the corridor for future transit. 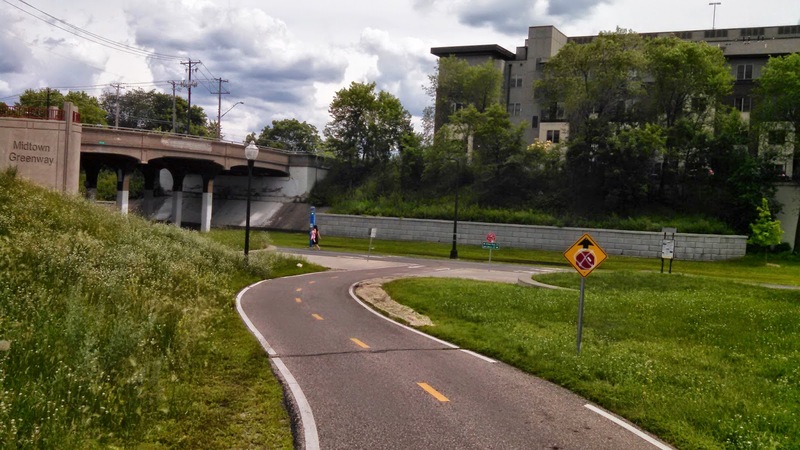 In August of 2000, Phase One of the Greenway bike and pedestrian trails opened from the intersection of 31st Street and Chowen Avenue to 5th Avenue. In most projects, you don't have this much right-of-way. Bicycle traffic is on the left and pedestrian traffic is encouraged to stay on the right. Connections to the urban street system are designed to minimize the grade. No traffic control for the intersection. Lower counts of people on the connections, allows mixing of the traffic. These ramps are significantly narrower than the main Greenway. 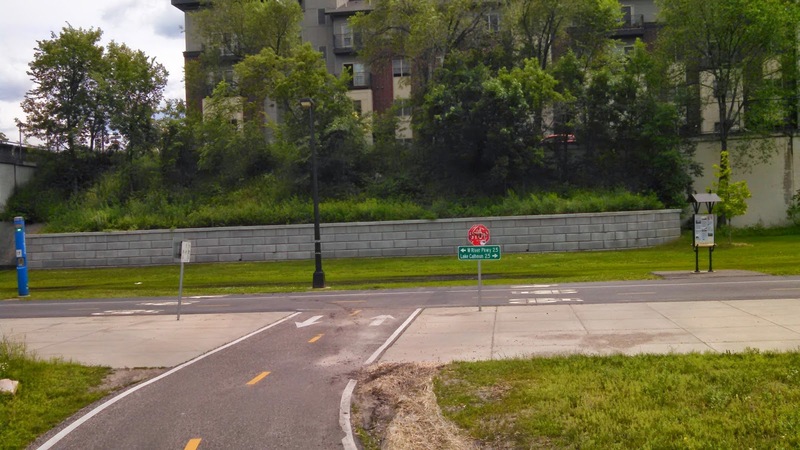 The intersection with the Midtown Greenway at 10th Street. This part of the facility must have been recently constructed. That font wasn't likely around in 1915.